Long distance movers Columbus Ohio, have moving agents always ready to handle every type of your move. Pick reliable long distance movers that are fully licensed, bonded, and accredited by the BBB. Years of experience are another reason why Zippy Shell Greater Columbus is your great fit! In your search for reliable long distance moving company, Zippy Shell Greater Columbus is your best ally! The beautiful landscapes and Ohio River are waiting for you in the “Buckeye State”. We make your long distance move a piece of cake! Why choose long distance movers Columbus Ohio? Because we have the most efficient and reliable way of moving your belongings for both local and long-distance moves. Just see the feedback from our content customers that we proudly display on our website. When it comes to long distance movers Columbus Ohio, quality is the key element in our service. Years of valuable experience has thought us to put your needs first and answer all of your demands in the best way possible. With us, you are guaranteed excellent service and a calm mind. With the first contact, you will know that you are hiring professionals who will handle your belongings with great care. We understand the obstacles and difficulties a long distance move can bring. We know how hard and intimidating it can be to pack your life, leave your home and move to a new and different place. Some of us have been there and have shared all of your concerns. However, all of us have dealt with customers that have done the same and we know how important this whole process is for you. That is why we put an extra effort to make this experience a marvelous adventure. We work hard to help you start this new chapter on the right foot and with a positive attitude. It is our goal to put a smile on your face and make you feel secure and relaxed. How does working with us look like? Our long distance movers Columbus Ohio will greet you with a kind word and a free moving quote. Once we’ve reached an agreement, a storage container will be delivered to your home, ready for loading. You won’t need more than two to three days to load your belongings. When you’re done, we will pick up your unit and store it safely. When you have decided upon your desired location, we will be swift with our delivery. Additionally, if you so desire to get something from the storage container, simply give us a call and your items will be delivered to you in a timely manner. We work in accordance with your possibilities and desires. We respect your schedule and are highly flexible. Our team of long distance movers Columbus Ohio, work fast and pay special attention to detail, no matter the distance. With us, you will know that your items are stored in safe and clean storage units. Rest assured that your belongings will be delivered to you in a meticulous state, just the way you packed them. Our drivers are reliable and experienced professionals that know how to handle long roads with great ease. In order to best address all of our customers’ needs, we offer services that everyone can find suitable. We take pride in the efficiency and quality of each item on the list that follows. It is worth noting that we’ve built such service and reputation with the valuable feedback of our customers. That is why we invite you to share your experience with us, in order to better ourselves and the service that we offer. Convenient mobile storage will be delivered to you upon your demand. Easy to pack and unload, it will be stored in our secure and climate controlled storage center. You are guaranteed safe and secure transportation of your goods. Every long distance move includes up to 30 days of free storage, eliminating yet another stress and cost. We know what a tight budget means, and have mostly worked with people who have restricted possibilities. That is the reason why we offer custom moving services Columbus Ohio that will fit your budget and schedule. A convenient mobile storage unit will be delivered to you upon your demand. Easy to load and unload, it will be stored in our secure and climate controlled storage center. If you wish to have it moved or delivered to a certain location, we will be quick to act. These are state of the art, waterproof and secure metal storage containers. They come with the option of staying at your location for the time being. One of the best things about them, however, is that our unique delivery system allows the unit to go anywhere. Firm casing ensures the safety of packed items during long transportation. We are well familiarized with the troubles of packing and loading. Some of you might not feel the necessity of professional aid, but the vast majority tends to struggle. That is why we offer reliable referrals to professional loading and packing services. These are provided by third parties coordinated by our staff. Know that we pay special attention when choosing our associates. When you hire their help, know that they provide genuine quality service. A storage container that is 7ft high, 7ft wide and 15ft long, with 105 square feet of space. For comparison, you can comfortably fit two to three well-furnished rooms in there. 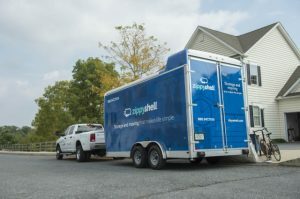 Our Zippy Shell trailers are 10.5 feet wide, 11 feet high and 22 feet long from the hitch to the back, and are able to fit in a regular parking space if required. This makes the processes of loading and unloading immensely easier. If it so happens that one container is not enough for the number of your belongings, simply call us and we will deliver another one to you. Just fill up your first unit, and on our way to pick it up, we will bring another empty storage container for you to load. Our moving and storage company offer you a wide range of services you can count on. 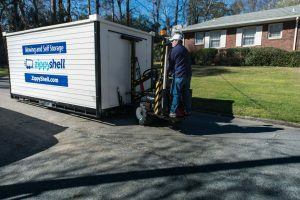 From packing, loading, moving to safe and convenient storage solutions, Zippy Shell can handle your long distance move with no worries. We are here to pay attention to every detail of your long distance move. No matter of the distance of your move, our long distance movers Columbus Ohio are dedicated to taking care of every step of your move. There are no obstacles for our professionals! After you hire our long distance moving services, soon you will realize you have settled down into your new house or apartment in Columbus. Give us a call to schedule your move today!